October 21, 2017, was the rainiest day in Portland, Oregon, in over 65 years. I had tried all week to convince my sister Martha to adjust her birthday plans accordingly. We are cut from the same teflon cloth, so I should have known she would stick with her plan to hike all 50k (31+ miles) of the Wildwood Trail in Forest Park. If you are an ultra runner, you may not realize this, but hiking with (adult) family is fun! I am making this distinction because hiking with kids may be rewarding, but not necessarily fun. For her second annual birthday trek on the Wildwood Trail, Martha setup a crew/pacing schedule based on last year’s actual times and an estimated 20-minute/mile hiking pace. One of the awesome things about this urban forest route is that there are numerous access points along the way, allowing for a constantly rotating party. Martha’s husband dropped us off in the dark to start at 6am and various siblings joined along the way. I helped shuttle one sister’s car and then bowed out at mile 20 when another sister joined in. Our brother Tom is an experienced backpacker and hiker, so I listened carefully last week when he suggested he may use an umbrella. He had been researching the topic for backpacking and had a reasonable light one by REI. Martha liked the idea, too, and choose a huge golf umbrella. 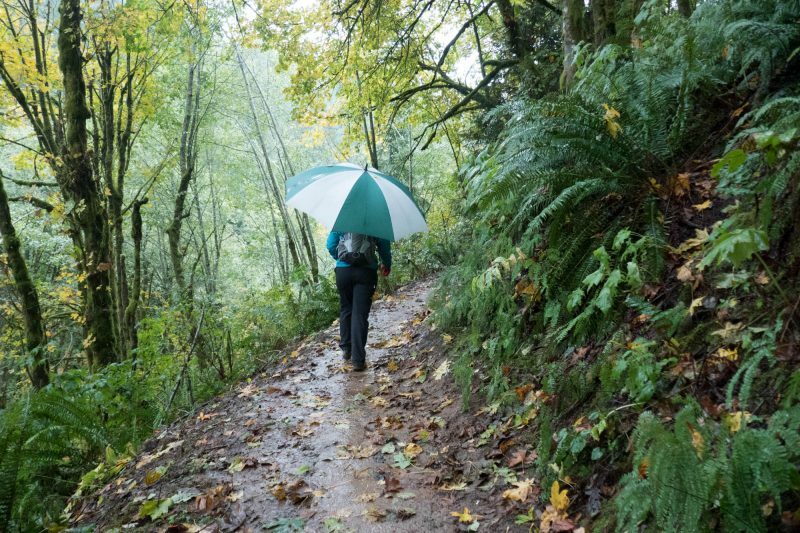 The only thing more bizarre than seeing an umbrella in Portland is seeing one the trails. As it turns out, Forest Park is an ideal umbrella venue! The Wildwood Trail, which runs the length of the park, is completely protected in the canopy. It rarely pops out of the forest and is therefore not subject to winds that would make an umbrella inadvisable. My generic umbrella held up better than fine. I even pushed my luck a bit by using it as a clearing/ramming rod when passing under low, wet limbs. I did have to take care to switch hands on occasion to avoid arm fatigue due to a lack of umbrella-specific-training. Tom seemed to have similar good luck with his umbrella. Martha’s large golf umbrella became too heavy to carry for the distance, but it was too short to double as a walking stick. She retired it before the halfway point. I’m very impressed and proud of Martha for completing her Wet and Wildwood birthday hike (despite my efforts to dissuade her,) even finishing about 30 minutes faster than last year. I had a few occasions to run ahead or back to meet the crew, at which time I was able to test my proposed new sport: umbrella trail running. It has great potential, especially in the water-well-endowed forests of the Pacific Northwest. Clearly, the influence of spending more of my years in California than my native Oregon has taken its toll. I. Love. Umbrellas. Eeeks! Don’t leave without your Little Big Burger!